- Gwanghwamun : after spreading its wings (lateral walls) over the past few weeks, the gate has just grown feathers (splendid dark tiles) and shedding duvet (the multicolor silhouette of Gwanghwamun was removed from the metal structure covering the renovation site). Inauguration day is definitely approaching, and I'm quite excited : I was glad to see the old Japanese government building disappear, and I can't wait to see the royal Sejongno-Gwanghwamun-Bugaksan-Bukansan perspective fully restored. 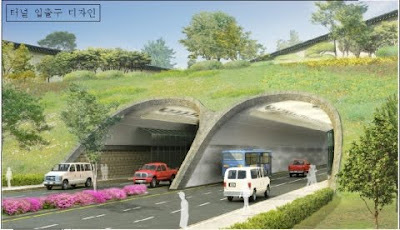 - To the East - Yulgokno tunnel (see "Jongmyo-Changdeokgung reunited") : here is what the 275 m long structure will look like around Donhwamun - Wonnam-dong. Constructors are being selected until September, work will start in October, and inauguration is scheduled for EOY 2012. As I mentioned before, I very much like the ideas of reconnecting Changdeok palace with Jongmyo, and of burying traffic underground, but the cultural alibi doesn't excuse the 50% increase in traffic (from 4 to 6 lanes, even if - or so do I hope at least - two are reserved for buses and public transportation). Traffic must be diverted from downtown instead of increased, and what Seoul needs is an underground circular bypass to aleviate traffic (ie beween East, Northeast, West, Northwest, without passing by city center). Furthermore, this is not a tunnel but a hill built over a road, with the risk of pulling further apart two neighborhoods. - To the West - sidewalk renovations West of Gwanghwamun towards Sajik-dan (see "Sajik-dan enshrined, Naeja-dong revived ?") are well advanced now on both sides of Sajikno, and the Gyeongbokgung Station exits far more welcoming. Note that Seoul is getting serious about the look of its streets : you've already noticed the nice grey booths for street vendors, and the elegant black signs mentioning touristic landmarks. 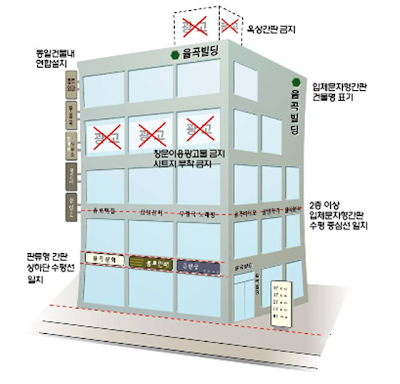 Jongno-gu voted stricter guidelines for outdoor advertising, particularly on commercial buildings. This revolution will not happen overnight, but change seems on the way.